Though we never lose sight of developments right across Europe, our natural focus is on what’s brewing in Brussels: the major beer-related topics on the EU agenda. In this first edition of our redesigned newsletter, we look at the role the brewing sector is playing in the circular economy, our active participation in informing the revision of the Audiovisual Media Services Directive in the area of alcohol advertising, and our #BeerWisdom campaign, which underpins how we are leading the drinks sector in providing the information consumers want. Major brewers are leading the drinks sector on sustainability with their reporting and positions on issues such as responsible drinking, while mid-sized and smaller brewers demonstrate a strong link to their communities through local projects and programmes. But participants at our recent strategy seminar on sustainable development in the beer sector held in Paris learnt that despite their strong performance in sustainability, brewers are underrepresented in leading rankings such as the Dow Jones Sustainability Index. In response to increasing demands from consumers and the adoption of the EU Directive in 2014 on non-financial reporting, we have set priorities for addressing the role of beer in its economic, environmental and societal context. Many brewers have already embraced the concept of sustainability and have linked their aims to the relevant United Nations Sustainable Development Goals. However, the lack of awareness reflected by external benchmarks means we need to seize engagement opportunities to develop a narrative as strong as the enthusiasm among brewers for having a positive impact on their world. We need to show how our industry, as well as generating around €51bn in EU GDP, is rising to the sustainability challenge by integrating the Sustainable Development Goals into our core business models. In harmony with our vision - “Teaming up to shape a beer-friendly, smart and prosperous EU business environment” - is the European Commission’s approach to the Circular Economy, which covers beer-specific aspects including water reuse, secondary raw materials, food waste and packaging waste. Companies and associations in the beer sector already see responsible brewing as natural. We now need to share our viewpoint more widely. Carbon dioxide may be what puts the head on a beer, but Heineken’s Göss brewery has got ahead in reducing emissions from brewing, leading to an EU Sustainable Energy Week award for becoming the world’s first major carbon-neutral brewery. The Göss brewery has used only renewable energy to produce its beer since the end of 2015. Innovation, investment, long-term commitment and community involvement are behind the Green Brewery Göss project, an example of best practice for the brewing industry as well as fitting within the Heineken-wide sustainability strategy entitled ‘Brewing a Better World’. The goal was achieved by using electricity from hydropower, biomass district heating, solar thermal energy and renewable energy from a newly built beer grain fermentation plant. From 2016 onwards, around 18,000 tons a year of brewer’s grains, filter residues and other residues from beer production will be processed into biogas at the site’s new beer grain fermentation plant, the first of its kind at such a major brewery. Some stakeholders criticise the boldness of the European Commission’s proposal on alcohol advertising, whereas we welcome how it recognises the complementarity between regulation and self- or co-regulation. Self-regulation is not a free ride. Strict codes are in place and are operating within robust, effective and credible systems. Europe’s brewers have been at the forefront of wider industry efforts to ensure that self-regulatory codes are operating within comprehensive systems and fit for purpose. And with clear and impressive results too. Independent juries, fast complaints handling, effective sanctions, copy advice and industry training are now the norm across Europe in the systems governing beer advertising. We have also been playing a major role in the preparation of the Responsible Marketing Pact, an initiative led by the World Federation of Advertisers to spread best practices to all corners of the continent and of the industry. This means we need a regulatory framework within which flexible, fast, culturally relevant systems can then operate effectively. We back the involvement of committees early in the process to identify, judge and advise on the acceptability of beer advertisements before consumer complaints are received and even before the advertisements appear in public. We also promote a checklist for companies developing a marketing scheme. Training is also a key area on which companies and associations have been working. We consider advertising for alcohol beverages in particular has profoundly changed for the better over the past decade. 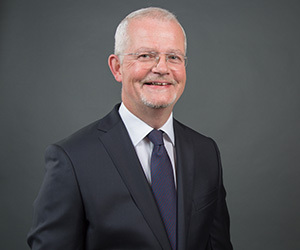 We are paying particular attention to digital advertising to ensure self-regulation keeps pace with developments in marketing as we continue to work with our members to identify the areas where national self-regulatory systems governing beer advertising can be further strengthened and roll-out updated codes and systems as appropriate. 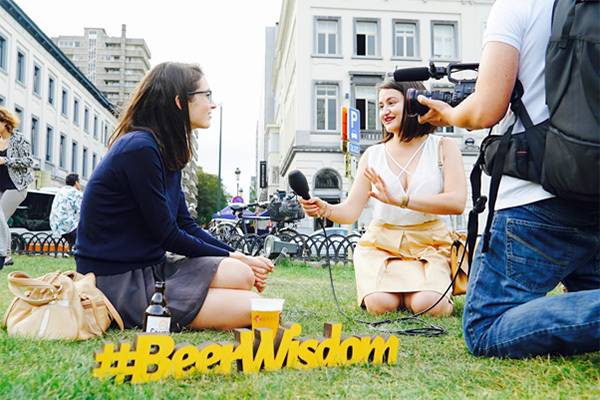 We took our cameras and 3D #tag to Place Luxembourg in Brussels to test the #BeerWisdom of drinkers there, notably European Parliament staffers as part of launching our new digital stakeholder engagement campaign on the eve of Global Beer Responsibility Day in September. However, as we emphasised in our press release, there is an entirely serious side to our efforts encouraging beer drinkers to taste our know-how wisely. And our work supporting responsible consumption with doctors’ groups, road safety authorities, parents, educators, the police, NGOs and consumer groups lasts all year round. And this is why, as well as releasing the latest reporting on the roll-out of our European Beer Pledge we are reaching out to our family of stakeholders with a digital approach aimed at engaging both sides of their brain: indeed, reason and emotion can go well together. See how the Place Luxembourg crowd fared in answering our questions and then see if you can do better in our beer quiz. Many initiatives were taking place across Europe to mark Global Beer Responsibility Day on 16 September. 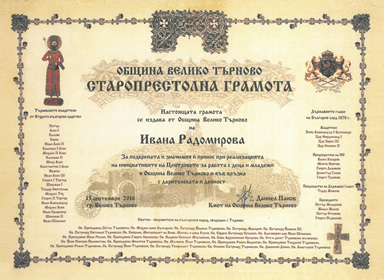 But in Bulgaria, the Union of Brewers in Bulgaria received a City Charter from the Mayor of the Municipality of Veliko Turnovo for its donations and contribution to the region. The Honorary Diploma was presented during a series of sports events and entertainment for families organised by the UBB together with police officers, school and local authorities. Meanwhile, in the capital Sofia, the UBB promoted their underage drinking prevention campaign “Sport is the better way children to grow up" with discussions between over 300 pupils and teachers. UBB also ran a Love Beer campaign in 2015 on TV, billboards and in shopping malls across the four biggest cities in Bulgaria to rebut myths about the category. It gained widespread positive feedback and continued through social media [LINK TO LOVE BEER BG], print ads and editorials in women’s lifestyle magazines and websites, as well as an exhibition of photos taken exclusively by women photographers. Bulgaria is a thriving beer market, showing an increasing interest in consumption of craft beer and production at microbreweries. The Bulgarian brewing industry employs 2,500 people directly (over 40,000 indirectly) and firms are investing in new products, packaging and equipment, focusing on optimising production processes.